I read a lot of books last year. A lot of books. 137 to be exact. So I put together a little booklet sharing some tips and ideas for how to read a lot. 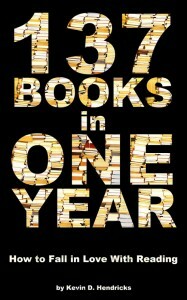 It’s called 137 Books in One Year: How to Fall in Love With Reading. You can go ahead and buy it for the Kindle or the print version, but when I officially launch it on Feb. 5 the digital version is going to be free for a few days. So you might want to wait. The booklet includes 10 tips for how to read more, with practical ideas like taking a book with you everywhere you go and reclaiming idle moments. It’s basically examining my reading in 2012 and trying to figure out how I read so many books. I’m sharing what works for me and it might work for you. While the title feels like a lot of bragging, the booklet also includes an interview with someone who read even more books than me. I hope you’ll check it out on Feb. 5 and help me spread the word.